Although I have not written much about Principia’s policies recently, Jesus couldn’t go to Principa College continues to be a popular post. It was meant to be a tongue-in-cheek piece pointing out that even the Son of God (or God himself depending on your theological perspective) wouldn’t stand a chance with Principia’s Admissions Department, but it recently acquired a comment which I felt was worth sharing and remarking on, the initial comment has been edited here for brevity and emphasis in bold is mine. Your clever point about Jesus not meeting Principia’s admission criteria is wonderful but hypothetical. Not hypothetical is the fact that many highly qualified, moral, and deserving young people are unwelcome to apply simply because they are not Christian Scientists–even if their Prin roots run deep. Notwithstanding this long-term association with Principia, my own daughter would not be welcome to apply. I left Christian Science many years ago, and we raised her in a different religious faith. But the truth is, I would have loved for her to have been able to attend Prin if it had been open to students from other faiths. I believe that exposure to peers from other religious traditions would be a good thing for Principia students and better prepare them to integrate successfully into the world outside the gate. Anyway, my daughter attended a college similar to Principia in many ways: a small university in the rural midwest with a connection to a religious tradition. Like Prin, the academics were solid and the teaching supportive, and it required students to adhere to a strict code of conduct. [Praise of daughter’s achievements]. And Principia keeps sending me requests to donate. Why should I resume donating when my children and grandchildren will be excluded? Do you think it just might be possible that Principia will change its policy some day so that good, moral, motivated students from other faiths will be welcome? What are they afraid of? Although the College is not affiliated with the Christian Science Church, the practice of Christian Science is the cornerstone of campus life. As a result, students, faculty, and staff are expected to be practicing Christian Scientists who rely on God for healing and regularly attend a Christian Science Sunday School or church. The simple fact of the matter is that Principia has no interest in highly qualified, moral and deserving young people who are not Christian Scientists. As they point out, all students, faulty and staff are expected to be practicing Christian Scientists. Principia does not admit practicing Christian Scientists who are openly gay, or relying on any kind of medication, regardless of how devout they may be, or what their Principia pedigree is. The commenter openly admits to having left Christian Science for a different religious tradition. Clearly something in Christian Science must have given them lingering doubts. I wonder how the conversation with Admissions, or with fellow students would go: “So your parents were Christian Scientists, but they left and raised you in a different religion? Why?” That kind of thinking would be dangerous and undermine the Cause of Christian Science – if they were but they left, what were the reasons? Why would they leave? Christian Science is Divinely Authorized and the One True Religion! Panic. I agree, it is important to expose people to other religions traditions, but that would cause questioning, after all, there is only one RIGHT and TRUE religion – Christian Science, and you can only circle back to CS so many times before it gets old. You could also argue that Principia is not trying to prepare students for life outside, they need to churn out more Good Little Christian Scientists to become CS Nurses, CS Practitioners, CS Camp Staff, Mother Church workers, and more Principia Staff. many employees qualify for two weeks’ paid leave for the purpose of taking Christian Science class instruction from an authorized teacher of Christian Science (when class occurs during regularly scheduled work time). Graduates of Principia College may reduce their student loan debt through employment at Principia. That’s all well and good, but these benefits are aimed at Christian Scientists. What Principia fails to mention is that not everyone can financially afford to work for Principia. Many of the support jobs – clerical, administration, etc. don’t pay enough to break even on living expenses, and Principa employees often take on additional jobs (occasionally off-campus) to make ends meet. Principia also fails to mention not everyone has a Christian Science spouse who can find work at the college, or in the Elsah, IL/St. Louis, MO area. In some cases, one spouse (usually the mother) will move to Principia (often with children so they can attend), while the other flies in on the occasional weekend to see their family. Principia hires the best people who are Christian Scientists, who want work for them, to live in the St.Louis/Elsah area, and who can financially afford to work for them (independently wealthy, have financially secure spouses, or have nothing more to lose and really need a job). It is a small pool candidates. Most of Principia’s hires are former students, often directly out of Principia, or a year or two later (perhaps they’ve had a year or two of grad school) to come teach or coach. I question the use of the “academic excellence” to describe education at Prin. Yes, some departments are solid but others, are a more grey area as long experienced teachers retire, or are moved into more demanding administrative positions, and are replaced by former students fresh out of grad school. Financial cuts have caused faulty cuts which leaves the remaining professors over-worked on multiple committees. The switch from the quarter to semester system has also caused strain on the professors, as has the bookstore’s new policy of not carrying textbooks. Academics aside, there are a few other issues, administrative reform, outbreaks of contagious disease, and the perpetual issue of Principia’s gay policies. If a non-Christian Scientist wants to go to a small private college in the midwest, there are plenty of them. If morals are important, there are colleges which make Principia look almost socially progressive. If Christian Science is important, you can always either attend the local CS Church, or find the Christian Science Organization (CSO) on campus. As a fellow alumnus of Principia, they continue to request I contribute as well. I have politely explained that I have paid off my student loans in a prompt and timely manner and they will not receive a penny more until they overhaul their social policies and dangerous view of radical reliance on prayer. I’m not sure if it will bring any comfort to the above commenter, but I find it reassuring that my children, who are most assuredly NOT being raised as Christian Scientists, will be unable to attend Principia. I have taken steps to ensure that my children are not immersed in religious extremism, and that includes the variety of Christian Science practiced by Principia. I want them to be proud to have attended their Alma Mater, and not silently dreading the question, where did you go to college? Friday Night Fun: Are you Rapture Ready? I have not considered this question before. 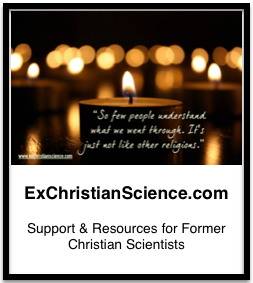 I do know that at our College Org at Illinois State University that the contacts with other religious groups on campus was one of the great experiences for the members of the Christian Science Org. In fact, the Org was part owner of the Campus Religious Building. After reflection, members of a Christian Science family but not CS who wish to go to Principia should be able to attend. I didn’t think many would want to go to such a perceived weird religion’s school, but from what was posted above, I’m mistaken. The Principia of today, Kat, is not someplace that I would want my grandchildren to attend. But I have another vision in mind, and even though I am no longer a Christian Scientist, I actually care about Principia. And frankly, I am worried about it. The financial and enrollment trends do not look good. And from what you have told us about the current state of the Prin experience, it seems that the place is also in decline academically and as a community. Much of this deterioration could be alleviated by opening up admissions to students who are not Christian Scientists but who otherwise meet admissions criteria. Enrollment revenues would increase, top-notch faculty could be retained, and the alumni support base would be broadened. And yes, it would also change the Principia experience–in a positive way, in my view. Successful Christian Science Organizations exist at dozens of colleges and universities around the world, so the notion that young Christian Scientists can’t thrive in a religiously pluralistic community is nonsense (note spindrifterr’s comment above). But if Principia continues to insist that its mission can only be met by maintaining an isolationist environment, then I fear the downward trend will continue over the long term. As financial pressures inexorably mount, I fear that Principia may do something awful like sell or lease a good portion of its beautiful natural setting for development (something obscene like a gated trophy-home community, golf resort, or office park). And who is to say that opening up admissions is not the better way to serve their cause? A tolerant and respectful interfaith campus community would stimulate young Christian Scientists to think beyond the 19th-century strictures that still bind the religion. Principia could become an incubator for a new generation of church leaders who can finally bring Christian Science into modern times, with an intelligent accommodation of medical science as a partner with prayer in the healing process. BCD – I happen to agree, but I don’t think the Principia administration shares our views. Prin does offer (or did while I was there) a class in comparative religion (I never took it, but I talked to some people who did, and I took a few other bible/religion classes during my time there) and at the end of the day it all circled back to how CS was “right” and the other religions were “so close” and yet so far (I touch on that a little in this post: https://kindism.org/2013/08/19/liberated – I think you commented on it). Prin has a long way to go before it would be accepting of non-CS, they don’t accept otherwise qualified CS who are LGBTQ, and most Principians have been raised with the idea that CS is the One True Religion. The “logic” of CS does not always hold up to scrutiny and it only takes a few seeds of doubt to undermine an already shaky foundation. It is easy to “fake” -or at least be passively CS at Prin- so many of us did it. You’re not forced to question it, Prin is “safe” you don’t have to defend (or logically justify) your faith. I’m not sure Prin could allow non-CS in without cracking down further on issues of free speech (for more on their policies: https://kindism.org/?s=free+speech), and I question their ability (and willingness) to integrate non-CS into their community. Regardless of their reasoning it would be an ugly and divisive issue.